Sweet Peach Facebook fan, Megan Oliver emailed me the other day to share a link to the Wood Studio in Arley, Alabama. She wanted to share their incredible wood work that exudes true Southern soul...and I'm so glad she did. 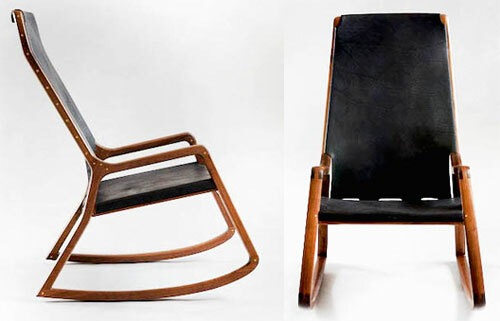 My personal favorite is this Lookout Mountain Rocker originally designed by Randy Cochran, Wood Studio's founder, almost 40 years ago. It's an exceptionally made piece and available in a variety of native hardwoods, including walnut, cherry, maple, ash, red or white oak. This wonderful piece Randy designed and can be used as a stool or an end table. Randy, along with his two sons Keith and Dylan, work together to custom make wood furniture and a handful of signature pieces. All the Cochrans take great care in their craft, using traditional techniques to create utilitarian pieces that are 100% built by one or two or all three of them. 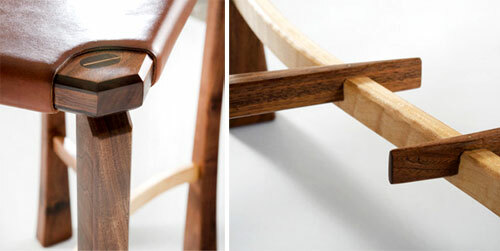 It's a labor of love to create simple, functional furniture that's built to last over 100 years. As Keith shares, "The work is only revealed once you take the time to look more closely at each piece and at each joint within each piece. Then you can see just how complex each piece of furniture is." This is the Beersheba Swing (pronounced Bursh'ba) and is Southern through and through. This swing was once quite popular in and around Beersheba Springs, Tennessee during the mid to late 1800's and thanks to the help of the Cochrans, has made a bit of a resurgence. I love how spacious these swings are. As Dylan shares, "We have built them from four feet to eight feet long and out of everything from sassafrass (which the originals were made from) to walnut and poplar." When I asked Keith what made their work uniquely Southern, he responded "All of our pieces are built out of necessity, therefore making each of our pieces very utilitarian. That is something that is always at the forefront of each of our designs- It has to work well. That to me is an overriding characteristic of Southern furniture." See all of their impressive work here. Thanks Cochran Family!